These days, there’s a good number of options available for travelling direct from the UK to Zagreb (with Croatia Airlines or British Airways – see our Flights to Croatia section for more details) so using Slovenia as a way of reaching Croatia is a little unnecessary. However, if you’re looking to combine these two neighbouring countries into one holiday, it is very simple to travel from Slovenia to Croatia! There are also flight connections from airports elsewhere in Europe to Ljubljana. 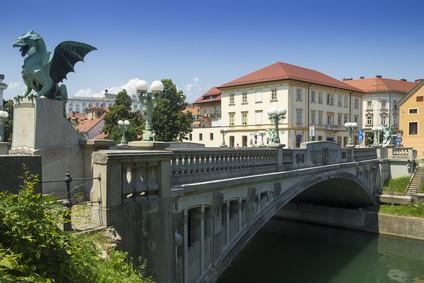 Upon landing at Ljubljana Airport, it is likely that you will depart the airport by bus. You will either make your way to downtown Ljubljana (a 30 – 45 minute journey) or to Kranj (15 minute journey). It is, in fact, advisable to travel to Kranj – it is only 15 minutes from the airport, and you can catch trains to Croatia from here. For timetables for buses from the airport to Kranj or Ljubljana, see the Getting Here section of the airport website. There are several direct trains per day from Kranj to Zagreb, with a journey time of approximately 2 hours 45 minutes. There are also several direct trains per day from Ljubljana to Zagreb, journey time approximately 2 hours 50 minutes. See timetables from Kranj or Ljubljana to destinations in Croatia at the Die Bahn website. The Slovenian Railways website also has a special section on Croatia, detailing services from Ljubljana to Zagreb, Rijeka and Opatija. Bus services from Ljubljana to destinations in Croatia are – perhaps somewhat surprisingly – rather sparse. There has been a recent increase on the Ljubljana – Zagreb route (pleasingly, as these two capitals aren’t that far apart!) and it’s best to look up schedules on the Zagreb Bus Terminal website. Slovenian bus company Arriva do also have a useful page on their services on this route. FILS run a twice-weekly service from Ljubljana (via Portoroz and Koper) to Porec and Pula. This route operates daily in high season (July and August) and it also makes more stops along the way – including in Rovinj. There are also a number of other summer-only (i.e. July and August) services from Ljubljana to places on the Croatian coast, including Porec, Rovinj, Rijeka, Zadar, Sibenik and Split. These are run by Slovenian bus company Arriva. Arriva also have summer services from Maribor in north-eastern Slovenia to Opatija, Rijeka, Krk and Crikvenica; Zadar, Pag Town and Novalja; and Sibenik. Slovenian Railways Timetable details for train journeys – we’d recommend using the Die Bahn website instead!